Recently I experienced a severely cracked lips, may be because of unbelievable hot summer or Bangalore and dehydration. I was on real hunt for good lip balms to get my lips back it smooth self. I was strolling in a Meenaxi mall and ended up getting inside the body shop and picked up couple of the body shop products. One of the product I picked up is Shea butter lip balm. This one comes in a nice, cute little pot which can be easily squeezed inside your hand bag or clutch. Product claims to have Shea butter which comes all the way from Ghana, Bees wax from Zambia and anti-oxidant Vitamin-E. Though the product texture is buttery, it’s not too light on lips, I ended up having a heavy feeling on my lips when I used in day time. Also it leaves white patch on the lips and my lipstick got messy when I tried applying the balm beneath my lip shade. I recommend you to use this product if you have severely cracked and dry lips and use it as bed time lip balm. It’s good to use during winter than in summer. The buttery texture actually starts melting on your lips, you can actually taste the shea butter and also fragrance is heavenly. But after a while its starts getting on to your nerves as the taste and fragrance are bit on heavy side. Do I buy this again? I may buy if I experience the severely dried up lips, but I would use it as my night balm. 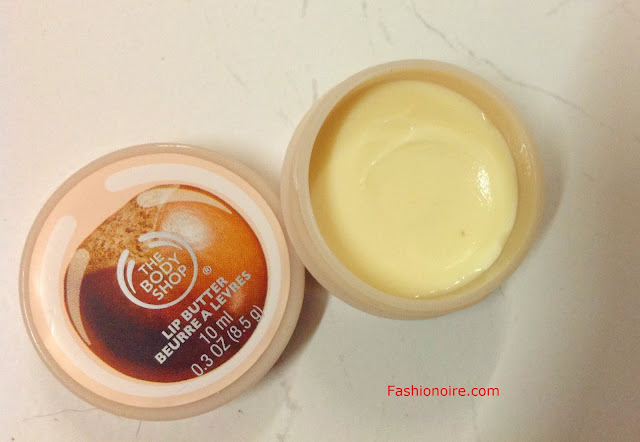 Body Shop products are raved and I have tried quite a range. Not all fared right, what more on a pricey side for my budget. And now, over here, we have quite a variety of home made natural organic products - cheaper and I am loving them.